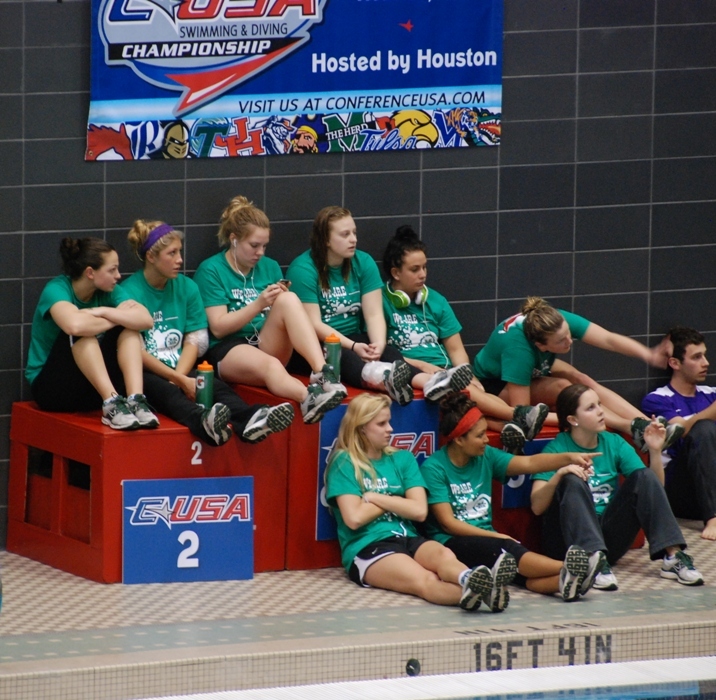 The girls watching the dive portion of the competition. Alex swam the 100 Back in Prelims. She swam a 58.82, which was a season best. It was not her PB though as she went 58.20 last year during high school champs. She finished 17th overall… 1st alternate for Finals! So close, but yet so far from making it to Finals. 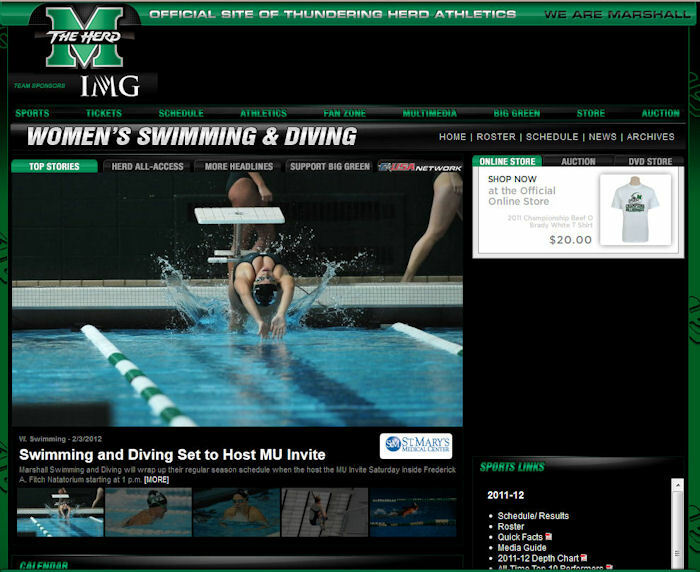 Still that time makes her the 3rd fastest back stroke swimmer in Marshall history. Alex, also, swam on the 200 Free Relay in finals. 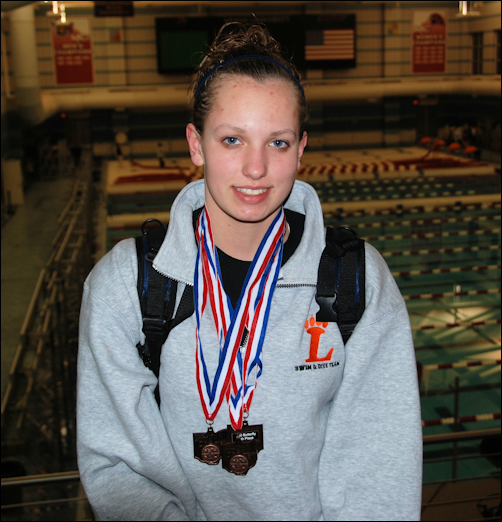 She swam the 2nd leg and recorded a 23.73 split a season and lifetime best swim for her. Her first sub-24 second swim in the 50 Free (relay or individual swim). 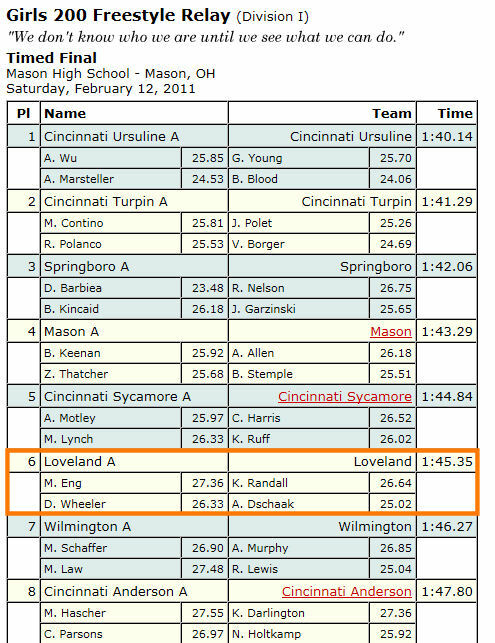 That was the fastest time of the Marshall swimmers on the relay. The relay finished 6th out of 6, but they were missing a couple faster sprinters. All in all the team did well and finished the day 5th in overall score. Alex had her first competition today. She swam the 50 Free. Her time was 24.70 which was a season best. While that wasn’t quite her goal time she was OK with it as her foot slipped on the block at the start. She finished 23rd overall after coming in seeded 31st. That gives her the 2nd best time on the team this season and puts her on the top 10 (9th) for all time performers in Marshall team history. Alex featured picture for upcoming meet. Alex finished the 1st half of the season on a strong note. In the final meet of the season she swam season best times in the 100 Back and 100 Free plus her best split in the 200 Free Relay. 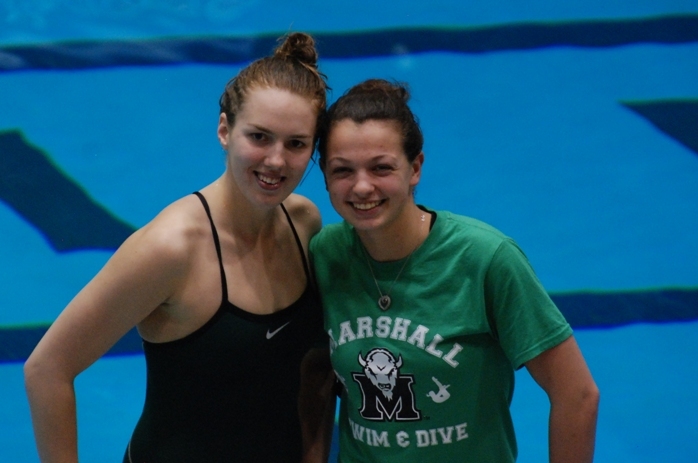 Those swims put her in the ranks of Marshall’s All-Time Top 10 Performers. Her 53.67 in the 100 Free was the best time in the 100 Free of any Marshall swimmer this season and puts her 10th on the all-time performer list. Her 59.85 in the 100 Back was the 3rd best 100 Back time of any Marshall swim this season and ranks her 6th on the all-time performer list. While these were season best numbers they are still over a second off her lifetime best times, so she has room to move up on these lists by the end of the season. 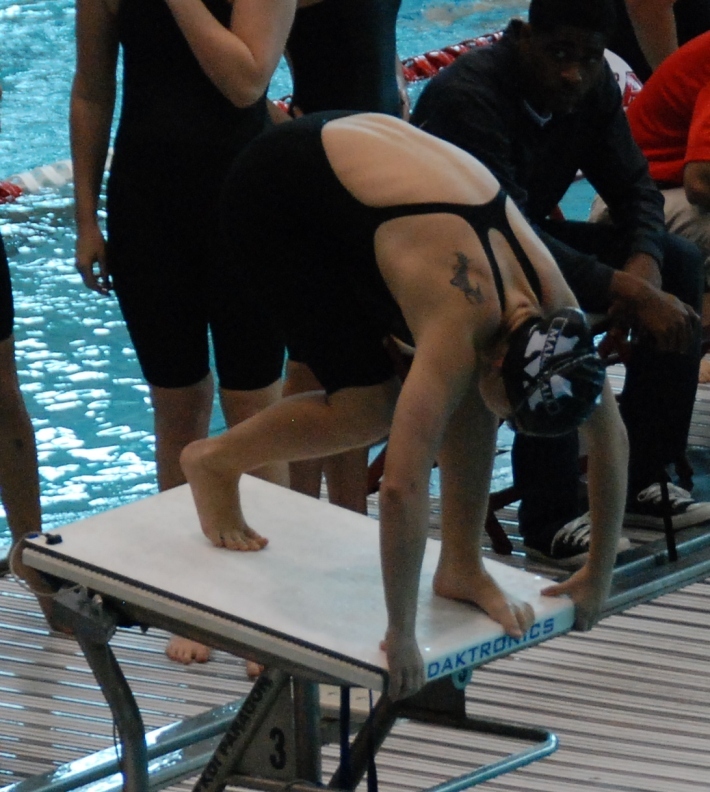 Alex swam her first college swim meet this last Saturday. 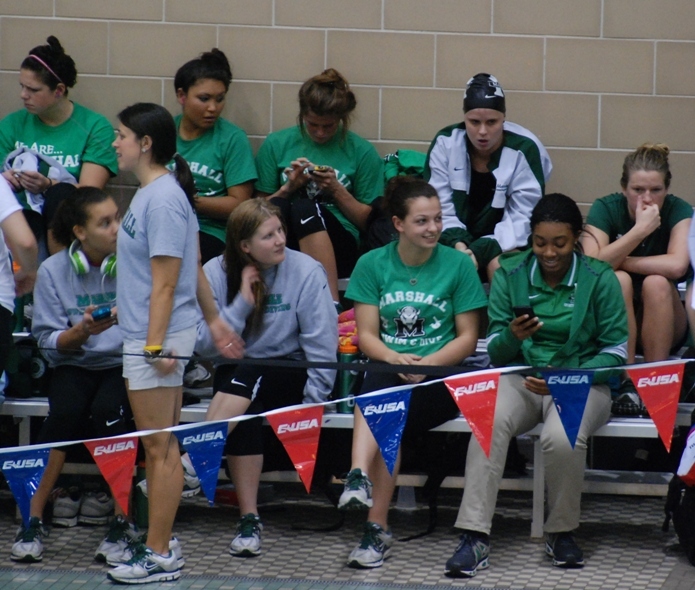 It was a quad meet against Radford University, James Madison University, and Campell University. They swam at Radford in Virginia. Alex swam two individual events and two relays. 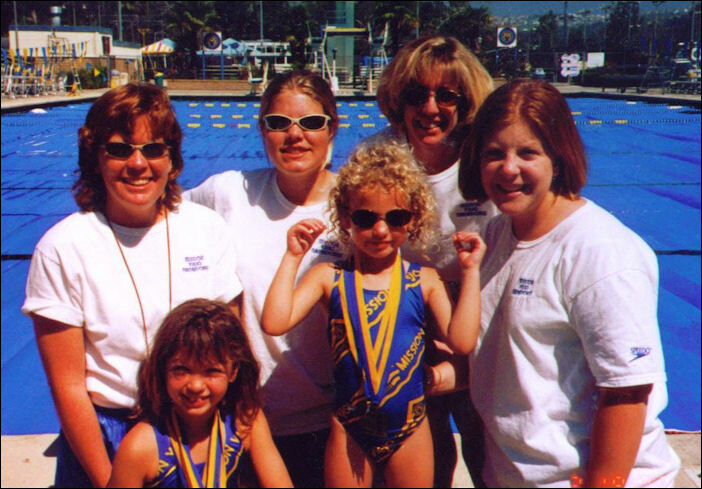 Her first event was the 200 Medley Relay which she was the lead off leg of the “A” relay swimming Backstroke. She went out in a 29.57 putting the relay in 4th after her leg. The relay finished 3rd overall. 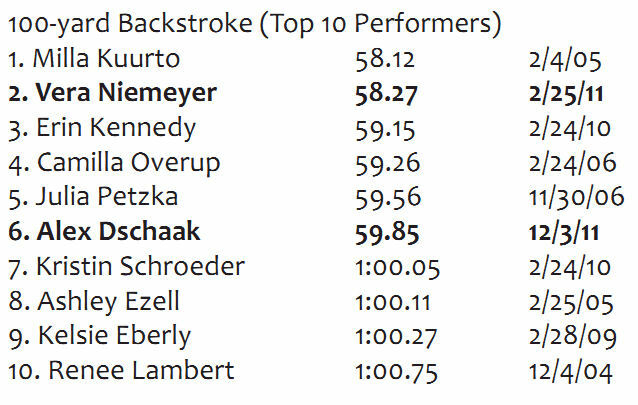 Next was the 100 Backstroke which she swam in a 1:02.44 for a 5th (of 15) place finish. 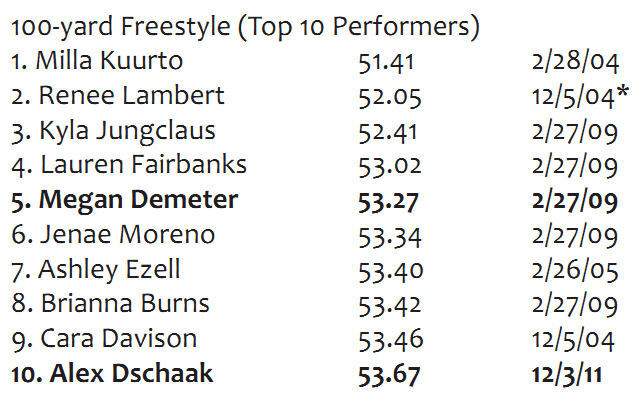 The 100 Freestyle followed that where she swam a 56.42. With that she finished 9th of 14 swimmers. She said her last 25 was really slow and expects to do better next swim. 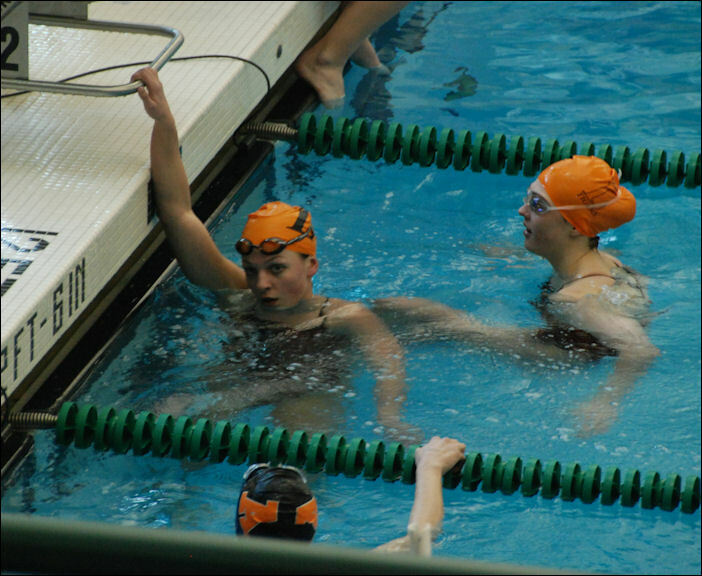 The last event was the 200 Freestyle Relay. Alex swam the 3rd leg of the “A” relay. She swam a 25.24 for the 2nd fastest split on the team (fastest was only .01 seconds faster). The relay finished 4th overall. 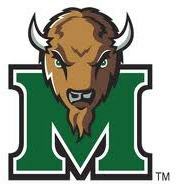 Marshall went 2-1 in the overall team competition beating Radford and Campbell and losing to James Madison. 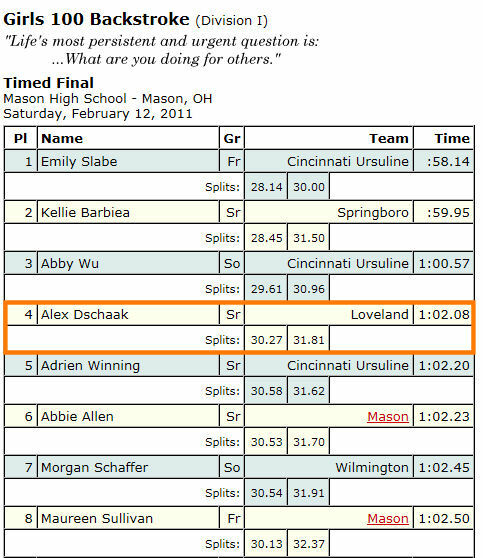 Yesterday, Alex and Taylor swam for Loveland High School at the Southwest Ohio District’s Sectional Meet. 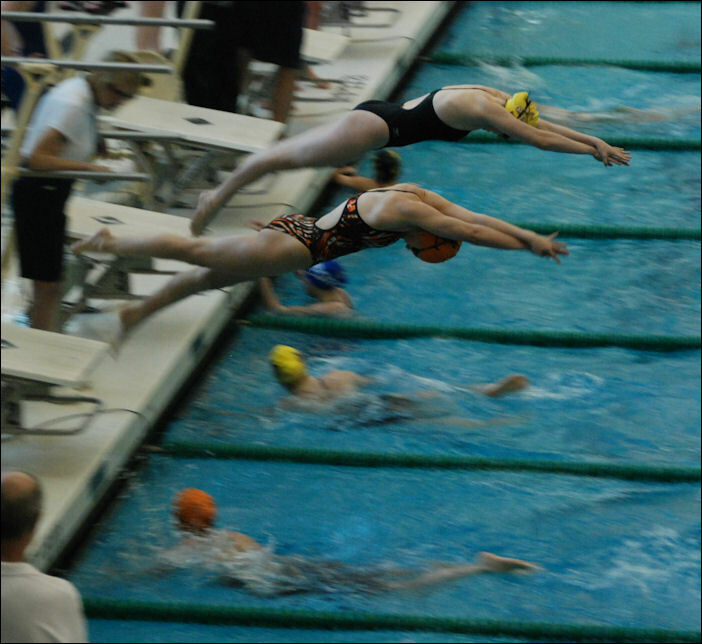 Sectional swimmers for Division 1 compete at three sites. Loveland High School was competing at the Mason site, which was the most competitive of the three sites. The top two swimmers at each site automatically qualify for Districts in each event and then 26 additional swimmers qualify based on time for a minimum of 32 swimmers advancing to Districts. For this meet Coach Ketchum split his talent amongst the three relays in order to ensure the girls would qualify all three relays for Districts. This meant Taylor swam the 200 Medley Relay and the 400 Free Relay with Alex swimming the 200 and 400 Free Relays. Additionally, Taylor would be swimming the 200 Free and 100 Fly for her individual events and Alex would swim the 100 Free and 100 Back. Alex’s events are somewhat challenging as the 100 Free is her 1st event near the middle of the order, so she swims four of the last six events. 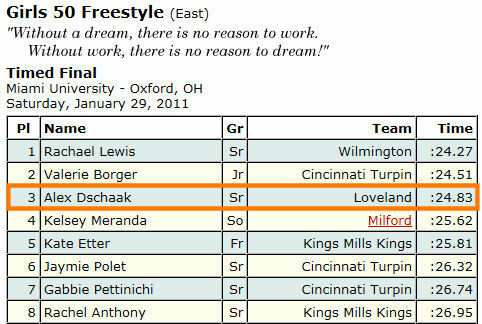 It goes like this: 100 Free (Alex), 500 Free, 200 Free Relay (Alex), 100 Back (Alex), 100 Breast, 400 Free Relay (Alex). The recaps by event are in order of swim. Videos of each are posted. Taylor was swimming the freestyle leg of the. She went in the water in 6th place and swam a 25.47 split to hold sixth. That was her fastest split of the season in a 50 Free leg on a relay. The 200 Medley Relay advanced to Districts and is seeded 13th. 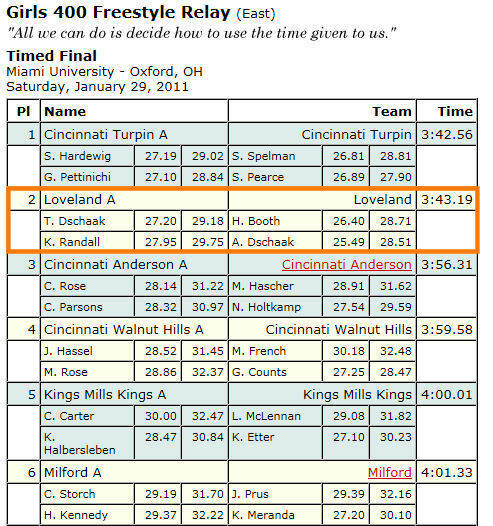 Taylor was seeded the 6th seed swimming in the final of seven heats. She swam a lifetime best 2:00.99 to finish 6th. The 4th and 5th place girls beat her by least than a tenth of a second. They were in lanes on the other side of the pool, so they weren’t close enough to be racing. She qualified for Districts seeded 16th. Taylor gets a fast start. Look how much she has already moved compared to the other girls. 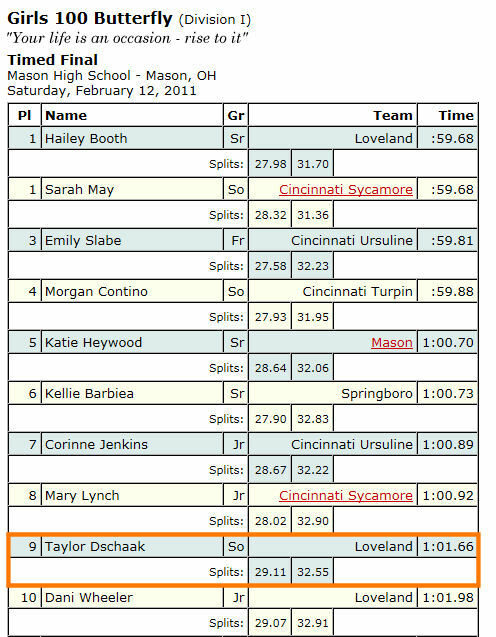 Next event for Taylor was the 100 Butterfly. She came in seeded 3rd. 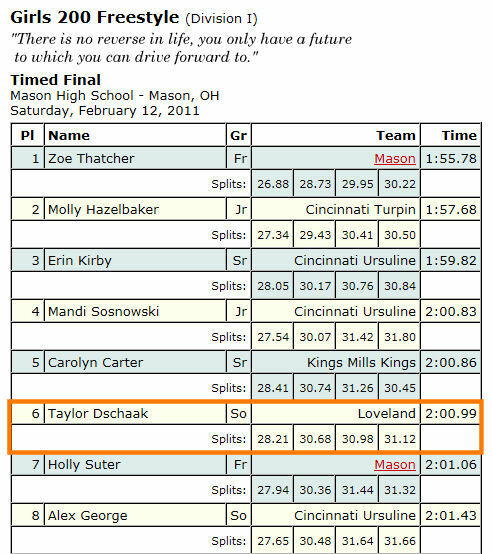 While she swam a season best 1:01.66, it was only good enough for 9th. Still good enough to qualify her for Districts seeded 12th. Alex finally got to swim her 1st event an hour and a half after the competition started. Alex came in as the #2 seed based on her time from State last year. 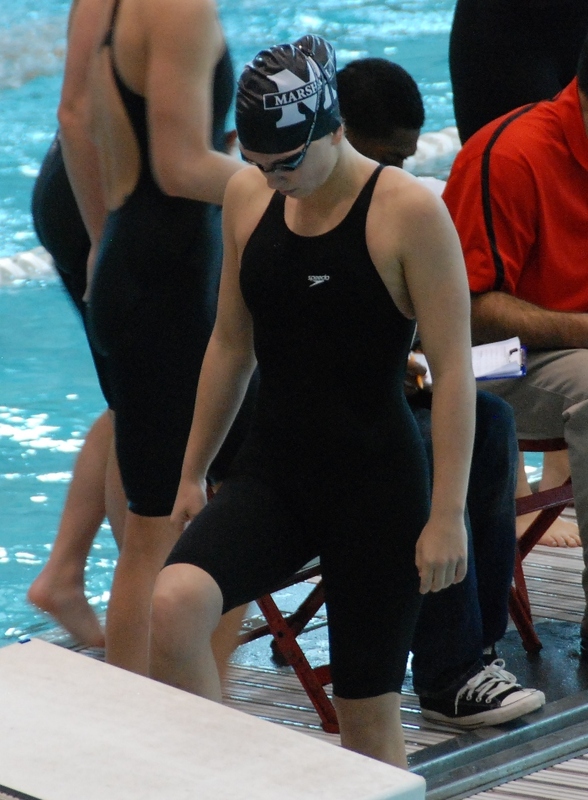 She had a season best swim with a 54.49 to finish 4th and qualify as the 6th seed for Districts. She has set a goal for this event to drop time from a year ago. She will be fully tapered and ready to go at Districts next week to go after her goal. Alex swam the anchor leg of the 200 Free relay. She swam a 25.02 split. She entered the water too far behind to make up any positions and too far ahead of the other girls to be pushes, so it was not her fastest split of the season. They finished 6th and qualified for Districts as the 13th seed. Immediately following the 200 Free Relay was the 100 Back. In fact if you watch the video you can hear them call for the 100 Back swimmers while Alex is still in the water. She was the #3 seed swimming in the 7th heat. She went out in a 30.27 in her 1st 50, which is not fast She needs to go out in the closer to a 29 second split to get under a minute. She finished 4th with a 1:02.08. 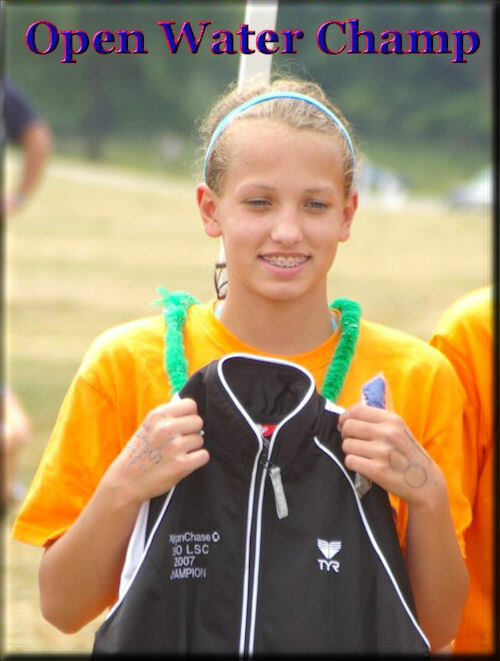 She went a 1:00.78 when she won FAVC meet, so it was not her best swim of the season. Still she qualified for Districts seeded 9th. 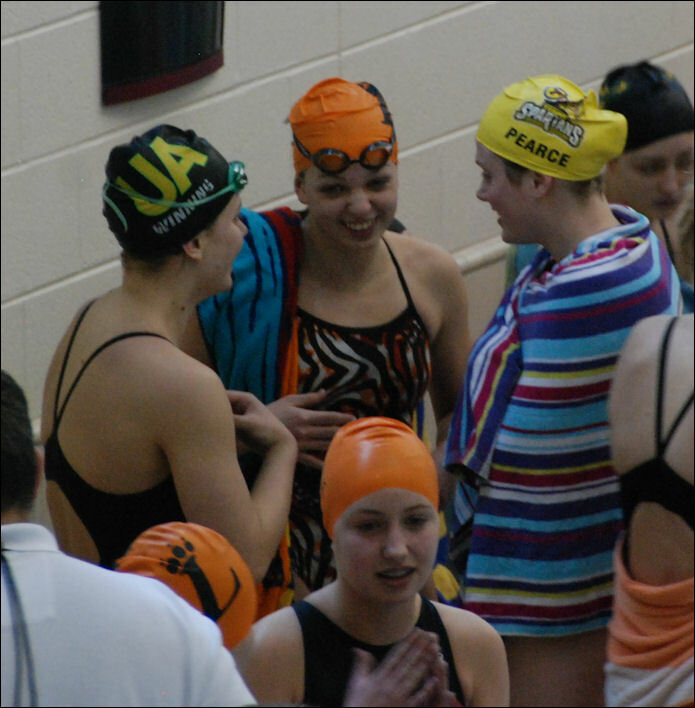 Alex with two of the girls she just swam against in the 100 Back. Fierce competitors in the water, but still friends out of the water. 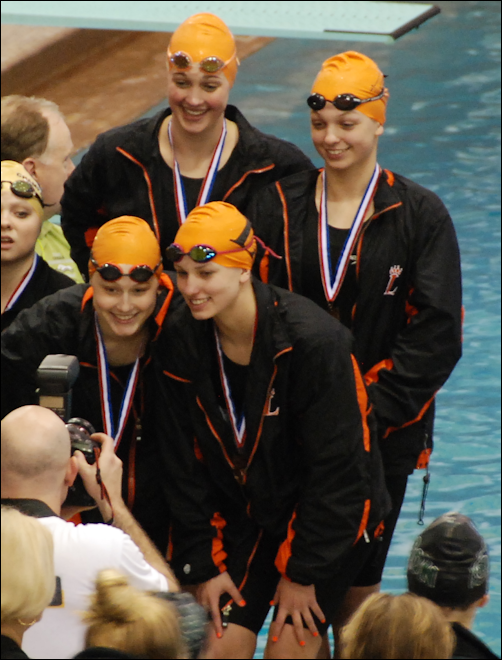 Last but not least was was the 400 Free Relay. Taylor was leading off and Alex was swimming the anchor leg. Taylor had a solid start with a 56.77 split. Only a little slower than her 56.38 at FAVC meet. That put them in 4th after the 1st 100. 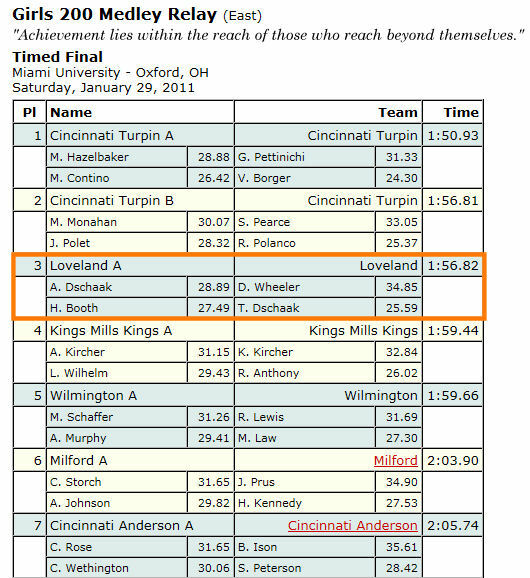 The 3rd leg came inslightly behind 3rd place Turpin. 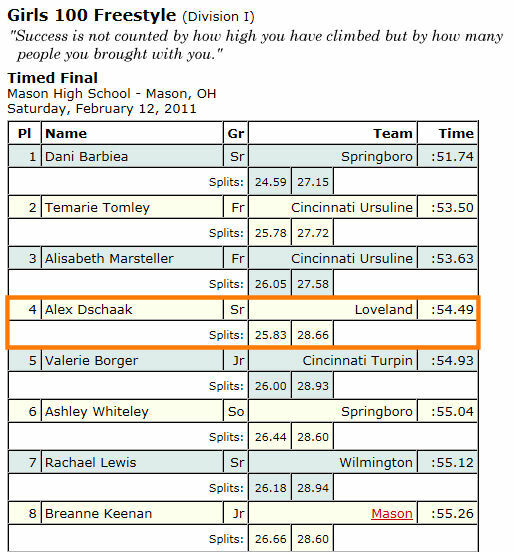 Alexquickly passed the Turpin swimmer in the 1st 25 yard to move Loveland to 3rd. She held that all the way until the last turn. 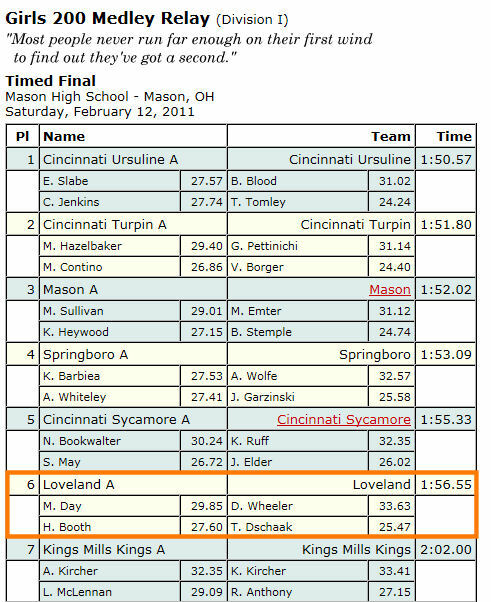 She was in a dead heat with the Turpin swimmer all the way down the stretch, but was out touched to take 4th by 1/10 of a second. 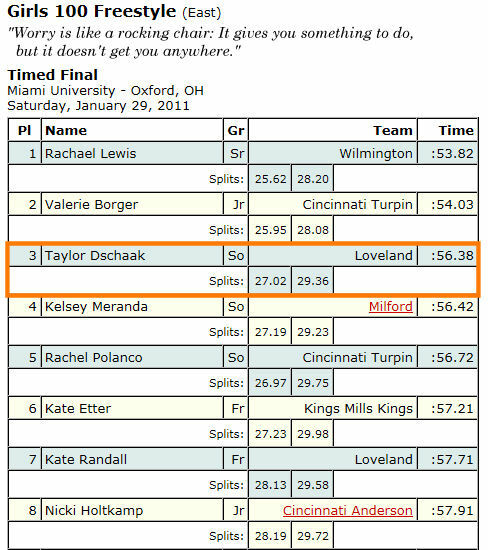 She swam a 54.79 split which wasn’t quite as fast as her 54.00 split at FAVC meet. Considering they came in seeded 6th a 4th place finish was a nice result. They qualified for Districts seeded 5th. Alex starting the anchor leg even with Turpin swimmer. It was close the entire final 100 Free with a damn close finish. Alex after the race with Hailey. 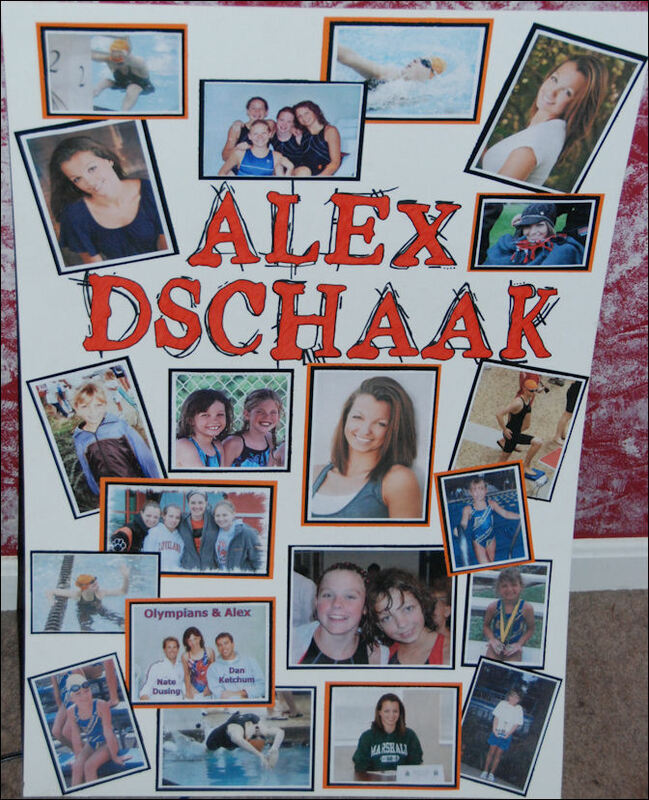 Here’s the picture collage Tanya made to display at Senior Night. 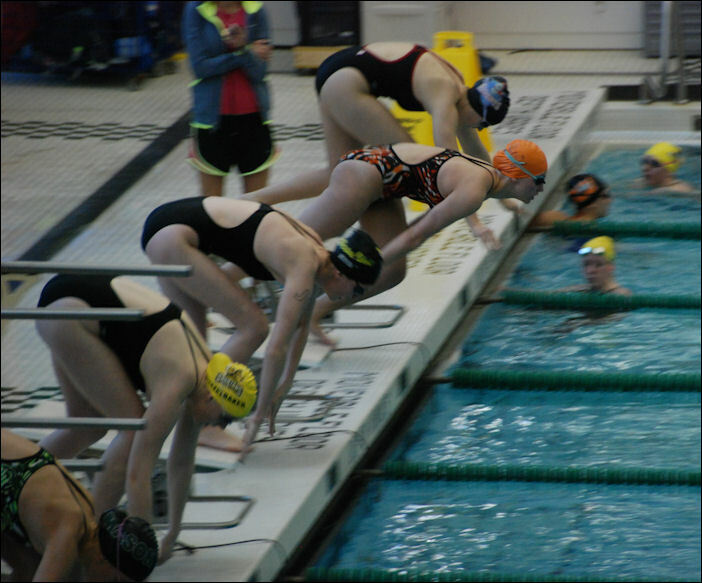 Last night Loveland High School swimmers competed in the conference championship swim meet. Alex & Taylor swam in 2 relays and 2 individual events each. Alex was the FACV Champion in the 100 Backstroke! 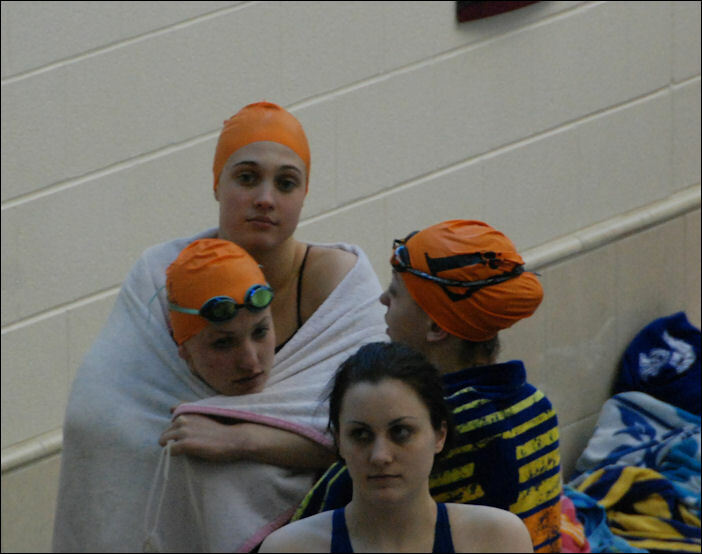 The night started off with the girls swimming in the 200 Medley Relay together. Alex led off in the backstroke leg and Taylor finished swimming the freestyle leg. Alex led of with a 28.89 split putting the team in a very close 2nd place (.01 seconds behind the leader).When Taylor entered the water the team was in 3rd. She swam a 25.59 split to hold 3rd place overall. 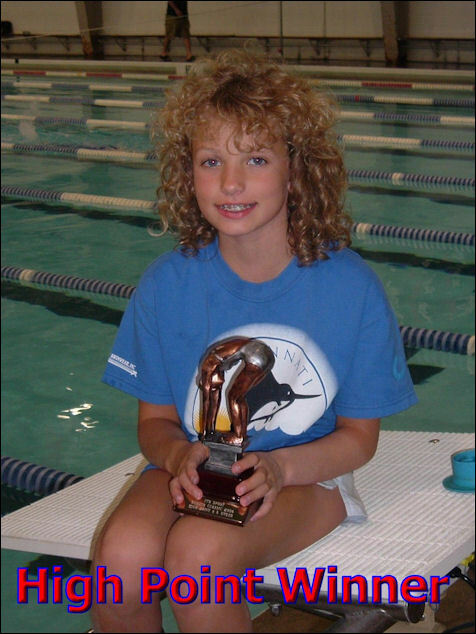 Taylor’s 1st event was the 200 Freestyle. 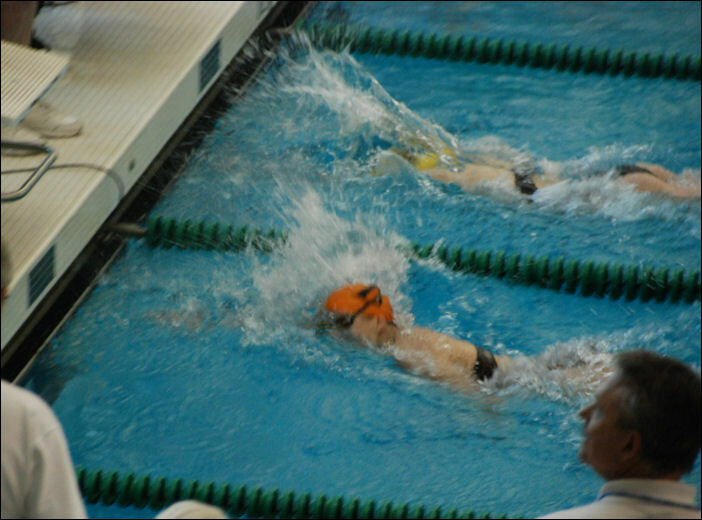 She was swimming in the final heat of six heats as the number 3 seed. She was in a 3 way battle for 3rd going into the last 10 yards. It was very close but the other two girls managed to get to the wall ahead of her and she finished 5th overall with a 2:02.20. That was her best time of the season as she had been consistently swimming in the 2:04 range. Alex swam the 50 Free as her first individual event. She went into the event as the number 2 seed of 56 swimmers competing. She swam a season best 24.83 and first time under 25 seconds this season for a 3rd place finish. 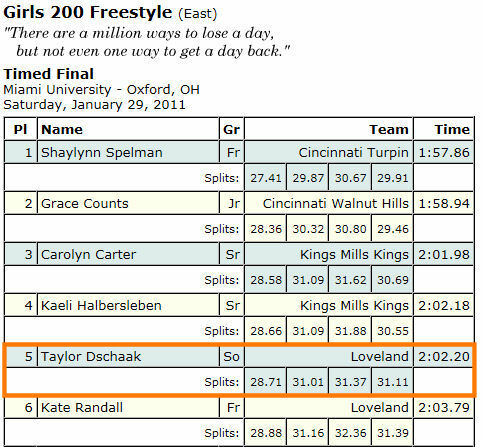 Taylor swam the 100 Free for her 2nd and last individual event (high school swimmers are limited to 2 individual events per meet). She entered the event the #3 seed of 56 swimmers competing. She had not swam this event all season other than as a part of the 400 Free Relay where she was swimming 57 second splits. She took 3rd with a 56.38 which was a good second faster than her previous relay swims and definitely her fastest of the season. 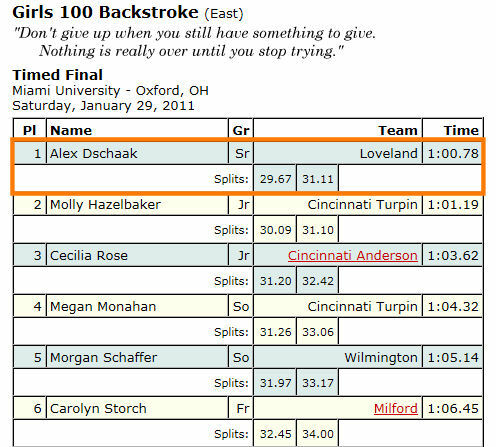 Alex was swimming the 100 Back for her final event. This is not an event she had swam all the much. At the Southwest Classic she swam a 1:03 and did not qualify for finals. I know she said then that in practice she had not spent much time on backstroke, so her confidence and comfort in the event was not real high. Well, she got off to a good start and led from start. Molly was close all the way into the finish. I was confident she had it, but I could hear a couple of people near me getting worried which made me get nervous. Alex won it with a 1:00.68 with her best time of the season earning her the FAVC Championship in the 100 Backstroke. Final event of the night is the 400 Free Relay. This time Taylor would be leading off and Alex would be swimming the anchor leg (the later the better since she had swam the 100 Back not all that long ago). Taylor had a great lead off leg with a 56.38 (same time as her 100 Free swim earlier) which had the relay in a virtual tie after the first 100. Hailey swam next and built a slight lead with Kate (a freshman) following her. Kate gave up the lead and was about a full body length behind when she hit the wall. This put Alex in the position of chasing. Something that she does very well. She closed the gap in the first 50 and was only slightly behind going into the final 50. She could not close that final gap over the last 50 as she finished with a 54.00 split and 2nd overall. That was her best split of the season- a fulls 1.5 seconds faster than anything previously. 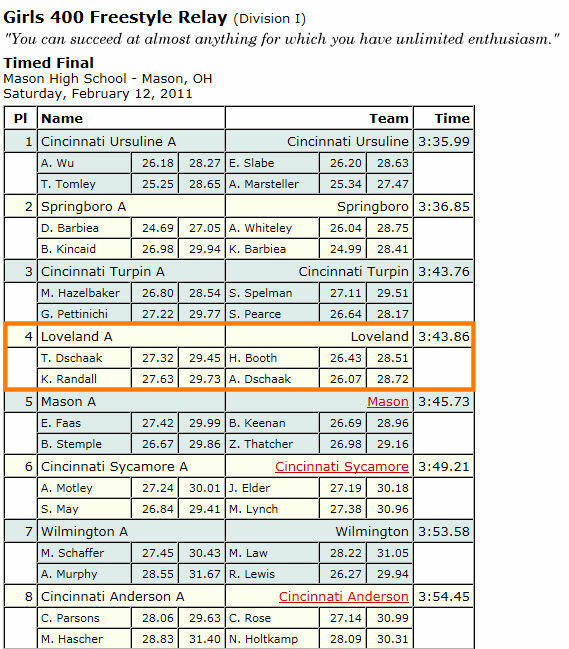 Recap of top swims for the Loveland High School swimmers at the Milford Invitational.